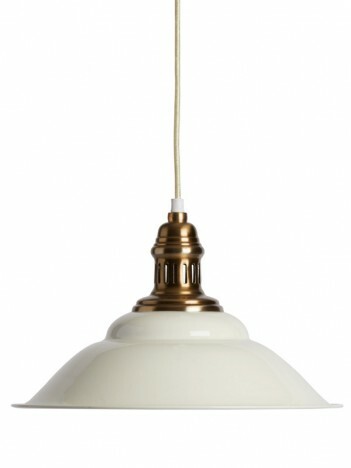 This is a powder coated creamy spun metal metal ceiling pendant with brass metal hanger and top that would catch the light. The cream braided cord is a nice details touch (L100cm). These would look great grouped together in a kitchen or over a table, or alternatively down the length of a hallway. The manufacturer recommends a max of 12 W energy saving bulb. It takes an E27 large screw bulb.